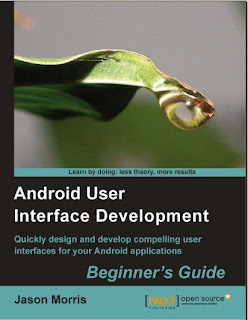 Packt Publishing has just released this book about Android User Interface Development from Jason Morris and I got a mail from them whether I could write something about the book in this blog. Why not, responded I and there came an e-book. Of course, I had a hidden agenda too. I am aesthetically challenged, so to say and therefore UI design is not really my strength. I intended to learn from a master. Like all of the previous widgets, the width should be fill_parent and the height should be wrap_content: android:layout_width="fill_parent" android:layout_height="wrap_content"
And so on, and so on. There are books and trainings that call themselves hands-on but this book works really the best if you type the code while you are reading. Using this style, the book gets surprisingly far, starting from the simplest Hello, World type of applications it discusses lists and their relations to data, widgets (even the most exotic ones), layouts, including custom layouts and finally animations. Meanwhile it never gives up its practical approach, e.g. it teaches you, how to create images with transparent backgrounds with Gimp. I really appreciated that bit because I know from my own experience that this detail can be hard to figure out. The author made some decisions that I found a bit strange. First and foremost, even though the title is Android User Interface Development, it does not discuss 2D (Canvas and co.) and 3D (OpenGL) at all. I am sure that some readers will miss these parts. I am big fan of command-line development environments but maybe Eclipse is better for beginners. All in all, I enjoyed this book and I even learnt from it. The book does not cover all the aspects of Android development but it addresses a very important application type. It is a good place to start with Android development.